Both basketball and football are in the top four favorite team sports in the US, but basketball is spread internationally, while football, which the rest of the world calls “American football” to distinguish it from soccer which is called football around the globe, is played only in America and in probably another 3 or 4 countries around the world. Basketball is an official Olympic event while football is not. Basketball is less expensive to practice and run, as it requires fewer gear, lower maintenance costs for the sport facilities and there are fewer players on the basketball team as compared to a football team. Also, basketball can be played by both genders, while football is for men only. Also, girls and women who play basketball are not required or expected to wear the sexist skimpy uniforms, such as in beach volleyball or lingerie football which are used to make “the game more interesting”. Basketball has simpler rules, involves only 5 people per team and has clear-cut penalty rules, as compared to the much more complicated rules of football, the 22 players involved and the sometimes very weird penalties involved in football need some time to be understood by newbies. Basketball is usually played indoors so the weather doesn’t matter for the players and the audience. Of course, the field dimensions are very different between the two sports. If you are looking for a contact sport, then football is the game for you. It is full contact and includes physical confrontations and tackles on every play, while basketball is a non-contact sport, and physical contact can lead to a foul. There are much higher scores scored at a basketball game as compared to football results. The length of the football game is 60 minutes, and basketball at a professional level is just 48 minutes, yet basketball player on average switch directions every 2 seconds and run about 105 short sprints per game. This requires much more athletic abilities and training than for football players. Soccer is the most popular sport in the world. In the US, it still hasn’t found its way up to the top 4 sports, but it is growing in popularity and is played for recreation, in schools, colleges and professionally. Basketball on the other hand is among the leading 4 favorite sports in the US. It too is played in school, college, professionally and for recreation. Both sports rely on spherical balls, but the ball types and the field types and dimensions are very different, and so is the scoring. Each goal in soccer is worth 1 point, no matter how and from where it is scored, while in basketball, the score can be 1, 2 or 3 points depending on whether it is long-distance, within the arc or from free throws. The goals in soccer are much bigger than basketball goals or rims. While a basketball contest is called a game, in soccer this is referred to as a match. Soccer includes two 45 minute half times, while in basketball there are four 12 minute halves at a pro level, or two 20 minute halves for college basketball games. One of the most obvious differences between the two sports is that in soccer only the goalie can handle the ball with his or her hands, the other players use their feet and in some cases their heads to advance and to score. In basketball, only hands are used, using your feet will result in a penalty. Both basketball and hockey are among the top 4 big sports in the US. Both are very energetic and fast paced games involving 5 players per team. Both sports are common and are practiced around the world, which explains the fact why there are so many international players on both basketball and hockey teams at a pro level. Both sports have quite clear-cut rules and have teams in areas with lesser populations around the US. 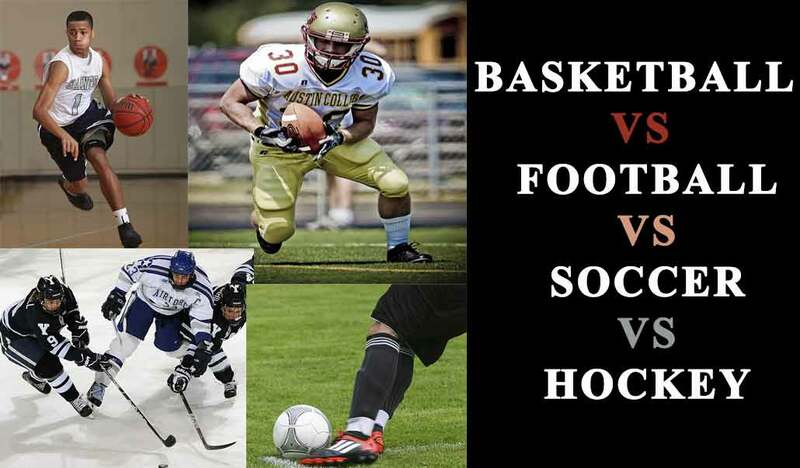 Apart from all the similarities, there are of course big differences between the two sports. Checking in hockey is acceptable, but in basketball running into or leaning on someone while shooting will result in a foul. A hockey team can take years to build while at least at a professional level, one or two superstar players are enough to make the game, if the other players on the team do their jobs. As for athletic condition and training, hockey is definitely the more demanding of the two. Hockey players put in a lot of physical effort when training and when playing. They must withstand getting hit by others as well as learn to hit others. They play both defense and offense during game. Fouls are calls less frequently than in basketball, so they need to be able to skate their way to the goal quickly and efficiently. Basketball players should be ready to quickly stop, start, jump, take short bursts and switch directions in a matter of seconds. This too requires a lot of training, coordination and athletic skills.